The community of Bahía Ballena in Uvita, Dominical, is part of the great Marino Ballena National Park and this September hosted the 8th edition of the annual Whales and Dolphins Festival. Nine years have passed since the first edition of the festival was done and the growth in the area is notable. The festival is the main activity through the year in the town, and it has promoted the whale watching tours in the area. Both locals and tourists come to the area to enjoy this magnificent spectacle of mother nature every year. The Whales and Dolphins festival has helped the development of the region. The number of visitors have experienced a remarkable increase: from hosting 4.430 tourists in 2009 to receive the visit of 40.000 people during the fest days. This is a small community based on the small and medium enterprises where the sustainability is the guide for their development model, as it is its major strength. The region knew how to take advantage of the nature without damaging the natural resources. The inhabitants are aware of the importance of taking care of the wildlife, the marine resources, and the environment in general. As examples of what they have done in order to reduce the human impact in this ecosystems, they change the engines of their embarkations to make them less noisy, at the same time they keep a close collaboration with scientists to plan and redefine the routes of the tours as a way to reduce the impact of the sea operations. Thanks to these efforts, the captains have reduced the fuel consumption and therefore, pollute less. Locals understand the importance of taking care of the wildlife and its habitat, as it is their main source of income. At the same time, they are trying to educate visitors in terms of nature protection and sustainability, as a way to ensure that if they come to the region they will be caring about the conservation actions learned. The opening of this festival favored the growth of local hotels and restaurants that join every year this activity. This is a sustainable model of development in which the whole community is involved and the natural resources are being protected. The nine species of cetaceans (dolphins and whales) that can be seen during the season are protected by the local tour operators by ensuring that the touristic operation in the area wont damage their life nor their natural environment for the adequate development. In 2011 the Costa Rican Tourism Board gave the festival a category of touristic interest. This ended to boost the activity in the area, in ways of social development, economic growth, and popularity as a touristic and sustainable destination among Costa Ricans and foreigners. This year’s edition of the festival offered alternative activities for those who did not participate of the watching tours. Some of them were a rock concert, talks, sand sculptures, activities for children with clowns, and more family activities for the entertainment of people of all ages and physical conditions. Bahía Ballena also offers different activities such as waterfall visits, birdwatching tours, forest hikes, yoga and surf lessons, snorkeling, and diving. It is a small village with many options to enjoy, without neglecting the scenic beauty that delight all kind of visitors. By 2017 the tentative dates of the festival will be the first two weekends of September. This will be a unique opportunity for a lifetime adventure. The increase of this activity has permitted an increase of almost 80.000 people visiting the South Pacific area of Costa Rica. This is a great news for the people of the region, due to the fact that the more tourists the community receives, the more development it will experience. The Tourism Minister, Mr. Mauricio Ventura, explained that the activity is a great attraction for both, locals and foreigners. “Only from 2010 to 2013 the amount of tourists watching whales in our country tripled, going from 43.302 to 131.373 tourists”, Ventura said during a press conference. Puerto Jiménez in Golfo Dulce, a province of Puntarenas, is one of the strategic places for the development of this activity. The whales arrive there attracted by the warm and shallow waters, two ideal conditions to rise and nurse their calves. The perfect season to look closely the whales in Costa Rica goes from July to October each year, and is a great spectacle for people of all ages and interests. You must come and experience with your own eyes this wonderful miracle of nature! You definitely won’t regret it! Have you ever participated in something like this? 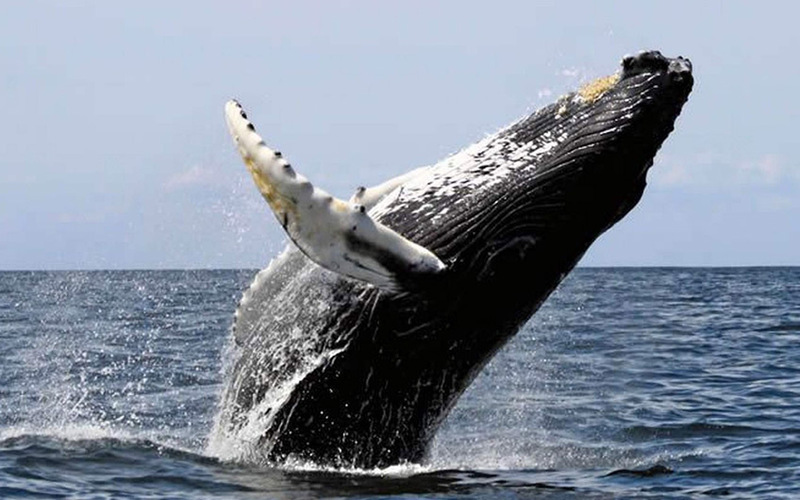 Did you watch whales in your last vacation to Costa Rica? If so, please share your experience with us in the comments section, so others can be delighted by it.